Visit Slovenia’s iconic attractions during a small-group guided day trip, departing from central Ljubljana. Slovenia’s abundance of beauty is seen from capital to coast. On this voyage you will cruise to the karst region to admire the Škocjan Caves, a UNESCO World Heritage Site. Then head to Lipica and observe the elegance of Slovenia’s Lipizzaner horses. Stop in the medieval coastal village, Piran, known for tasty local seafood specialties and stunning views of the Adriatic Sea. This tour is limited to eight people to ensure a personalized experience. Meet your professional guide at your central Ljubljana hotel and board an air-conditioned vehicle for a pleasurable tour of Slovenia. Then cruise about 40 minutes to visit one of the natural treasures of the planet, Škocjan Caves, a UNESCO World Heritage site. Listen as your guide explains why this underground canyon is a one of few natural phenomena in the world. Before continuing on, stop for break and savor some local prosciutto paired with a glass of Slovenian wine (own expense). Now, continue to charming Lipica* and delve into an equestrian experience. 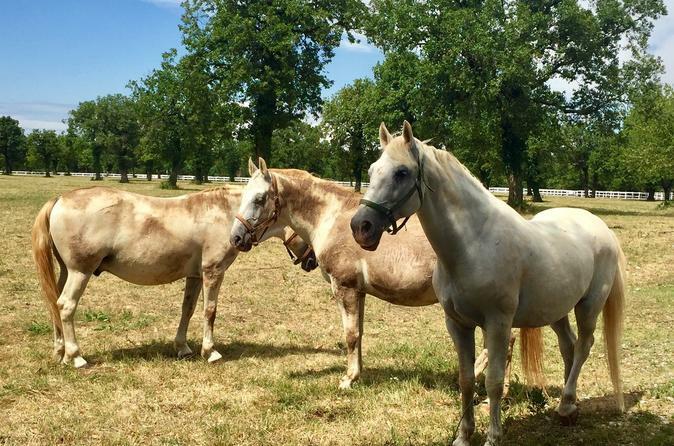 Visit the famous white Lipizzaners and gain insight into the oldest European stud farm producing the oldest cultural horse breeds. From here, it’s 28 green miles to the coast and Piran. Wander the cobblestone streets of this medieval village and discover its alluring squares and coastal vantage points. Pick a restaurant in town and enjoy local fish specialties (own expense) or grab a swim in the sapphire blue Adriatic Sea. Dry off and buckle up for a ride back to your hotel Ljubljana. *Note: the visit to the Lipizzaner horses in Lipica is not possible during winter (November to March) Horses are kept in the stables during the cold season and are not accessible to visitors during that time. Jon was a wonderful tour guide and the scenery sensational. I would highly recommend this all day trip. We were picked on time, vehicle was good, spacious, choice of locations and actual visits were well timed with driver giving good info everywhere. Great day out visiting the coast and the caves. We visited in March and it was still basically winter so weather was quite cold. That didn't stop us having a lovely time and in a way, made it more magical. This is a very well-organized tour and you manage to do/see a lot of varied sights within the 10 hours. Tjaša was a great driver/guide she kept us well on time and shared a lot of interesting/fun information as well as entertained our questions. I would highly recommend this tour for anyone who wants to combine a visit to the World Heritage-listed Škocjan Caves with a bit of Slovene Istria. The Karst Prosciutto and wine tasting is a good, value-for-money option to take up as a light lunch and it lets you spend more of your time in Piran exploring instead of having lunch there. 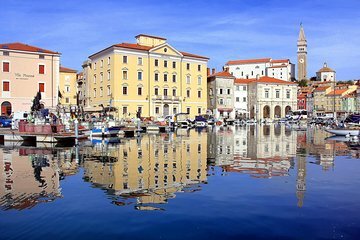 My only suggestion to make this tour 100 perfect would be to cut down on the time in Piran you could easily visit its main sights in an hour and a half once you exclude lunch and use the spare hour to enter Predjama Castle it is only an exterior photo-stop on this tour due to the time constraints. Very good transport conditions and the girl with as was so kind and knowledgeable. She gave as a lot information for different things. Everything was like was planned. Not a good tour, we were supposed to go to 4 places but went to only 2. Badly organised, we were only transported from place to place with no value addition! Wouldn't recommend at all! One of the best tours I have done. Roundabouts tour guide Luca was amazing. Very knowledgable! He made the tour very enjoyable! I loved the caves, which are better than Postojna in my opinion, as you get the proper experience walking with a guide. Piran is an amazing little coastal town. It was absolutely stunning! The castle was great to see even if it was only from the outside. Thanks Luca for one of the best tours I have ever done! Great day out seeing the cave, horses, the coast and trying the wonderful food. Our tour was great. Our driver/guide was helpful with information and history. Our day was entertaining, with enough activity to satisfy us. The caves were amazing the coastal city was lovely. Our guide told us what was special to buy. Wonderful day and a great investment.